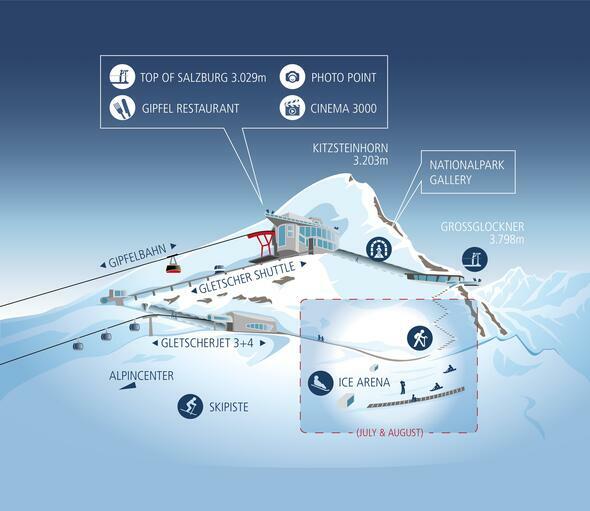 Only a 25-minute walk from the Alpincenter, climbers will find secured climbing routes for all skill levels. Route sketches and topographic maps are available from the InfoService in the Alpincenter or as a download right here. **reduced up and downhill trip with guest card for guests of Zell am See-Kaprun and every Pinzgau municipality. Family Bonus: Parents and the two eldest children/youth* pay the Family Price, all other children/youth* travel for free. Dogs are transported (EUR 6,00 to peak station and back). Dogs must wear a muzzle (muzzles can be hired at the ticket office & InfoService). Up and downhill tickets are valid for tourists without ski equipment.